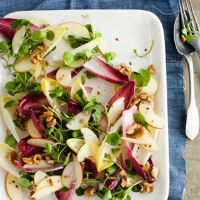 The bitter chicory leaves are balanced by the sweetness of the apple in this refreshing autumnal salad. It also provides you with two of your five a day. 1. Halve and core the apples and cut into very thin slices. Lay out on a large platter and dress with lemon juice and walnut oil and sprinkle with the coriander seeds. 2. Separate the chicory leaves and arrange on a large platter with the watercress. Spoon over the apple slices and the juices. Scatter with walnut pieces and serve. Tip. This salad is very lightly dressed with just lemon juice and walnut oil. If you want to dress it up a bit more, try a splash of Waitrose half fat olive oil dressing.